The Battle of Kadesh was fought in 1274, 1275, 1285, or 1300 BC during the conflicts between the Egyptians and Hittite Empire. In response to waning Egyptian influence in Canaan and Syria, Pharaoh Ramses II prepared to campaign in the region during the fifth year of his reign. Though this area had been secured by his father, Seti I, it had slipped back under the influence of the Hittite Empire. Gathering an army at his capital, Pi-Ramesses, Ramses divided it into four divisions dubbed Amun, Ra, Set, and Ptah. To support this force, he also recruited a force of mercenaries which were dubbed the Ne'arin or Nearin. Marching north, the Egyptian divisions traveled together while the Nearin were assigned to secure the port of Sumur. Opposing Ramses was the army of Muwatalli II which was encamped near Kadesh. In an effort to deceive Ramses, he planted two nomads in the path of the Egyptian advance with false information regarding the army's location and shifted his camp behind the city to east. Taken by the Egyptians, the nomads informed Ramses that the Hittite army was far away in the land of Aleppo. Believing this information, Ramses sought to seize the opportunity to capture Kadesh before the Hittites could arrive. As a result, he raced ahead with the Amun and Ra divisions, dividing his forces. Arriving north of the city with his bodyguard, Ramses was soon joined by the Amun division which established a fortified camp to await the arrival of the Ra division which was marching in from the south. While here, his troops captured two Hittite spies who, after being tortured, revealed the true location of Muwatalli's army. Angered that his scouts and officers had failed him, he issued orders summoning the remainder of the army. Seeing an opportunity, Muwatalli ordered the bulk of his chariot force to cross the Orontes River south of Kadesh, and attack the approaching Ra division. As they departed, he personally led a reserve chariot force and infantry north of the city to block possible escape routes in that direction. Caught in the open while in a marching formation, the troops of the Ra division were quickly routed by the attacking Hittites. As the first survivors reached the Amun camp, Ramses realized the severity of the situation and dispatched his vizier to hurry the Ptah division. Having routed the Ra and cut off the Egyptians' line of retreat, the Hittite chariots swung north and assaulted the Amun camp. Crashing through the Egyptian shield wall, his men drove Ramses' troops back. With no alternative available, Ramses personally led his bodyguard in a counterattack against the enemy. 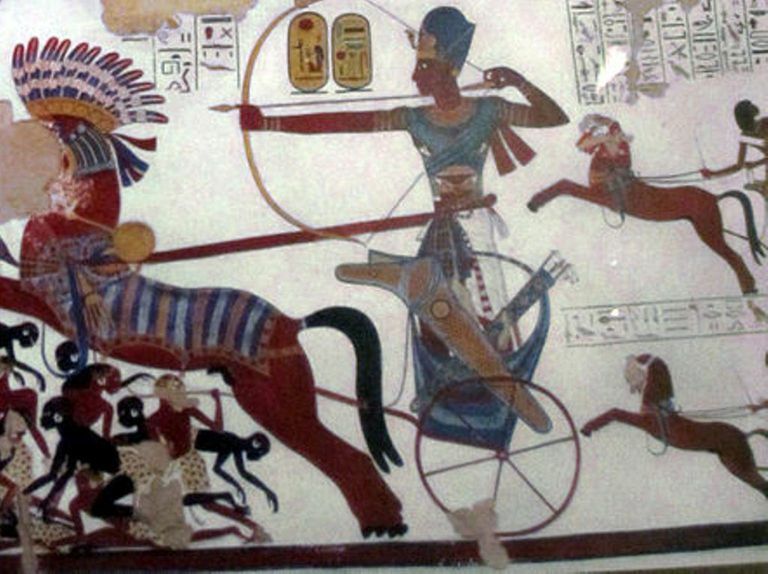 While the bulk of the Hittite attackers paused to loot the Egyptian camp, Ramses succeeded in driving off an enemy chariot force to the east. In the wake of this success, he was joined by the arriving Nearin which swarmed into the camp and succeeded in driving out the Hittites who retreated towards Kadesh. With the battle turning against him, Muwatalli elected push forward his chariot reserve but held back his infantry. As the Hittite chariots moved towards the river, Ramses advanced his forces east to meet them. Assuming a strong position on the west bank, the Egyptians were able to prevent the Hittite chariots from forming and advancing at attack speed. Despite this, Muwatalli ordered six charges against the Egyptian lines all of which were turned back. As evening approached, the lead elements of the Ptah division arrived on the field threatening the Hittite rear. Unable to break through Ramses' lines, Muwatalli elected to fall back. While some sources suggest that the Hittite army entered Kadesh, it is likely that the bulk retreated towards Aleppo. Reforming his battered army and lacking supplies for a long siege, Ramses elected to withdraw towards Damascus. Casualties for the Battle of Kadesh are not known. Though a tactical victory for the Egyptians the battle proved a strategic defeat as Ramses had failed to capture Kadesh. Returning to their respective capitals, both leaders declared victory. The struggle between the two empires would continue to rage for over a decade until concluded by one of the world's first international peace treaties.